It’s been a long dry spell. I don’t mean rain. The garden is a real mess but with the spouse’s help and good weather and not-too-hungry critters, we plan to coax it back into shape this year. We’ve been weeding and digging, and I began to sow seeds indoors about two months ago and transplanted seedlings into the garden a week ago or thereabouts. So, this is the makings of the first salad of the year entirely of our own greens. I made a simple vinaigrette of pink wine vinegar, a couple drops of Datil pepper vinegar, salt, black pepper, a small amount of walnut oil and a larger amount of olive oil. 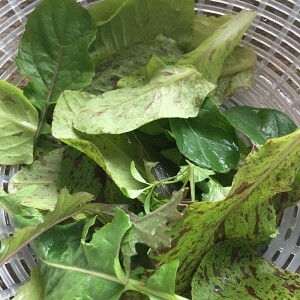 The greens are ‘Forellenschluss’ lettuce, purple mizuna, arugula, and garden cress. A radish was also involved, but I didn’t take a picture of it.